I had my second PTA meeting last night at the kids' school. We had a bunch of different stuff all going on at the same time, so I had asked a student of mine to take the boys out to dinner while Ken had Frances and I was at the meeting. I had talked all week to the boys about Miss Deserae coming to take them out to dinner. They were really excited to go to McDonald's. I had even told them that Deserae was going to take my car so we didn't have to move car seats. I was slightly worried that Benjamin wouldn't want to go, so I kept going over the plans. I thought I had been pretty thorough, but when we pulled up next to Deserae's car in the school parking lot Benjamin looked out the window and yelled, "Dis not McDonnels!!!" and started crying! Thankfully Deserae said he calmed down as soon as he saw a "skoo bus" on the way to dinner and he was fine the rest of the night. Henry is a full head shorter than all of his classmates! The kids' school is a Title 1 school which means that they receive federal funds for their programming. In return for the funds they are required to put on several programs during the school year for parents. 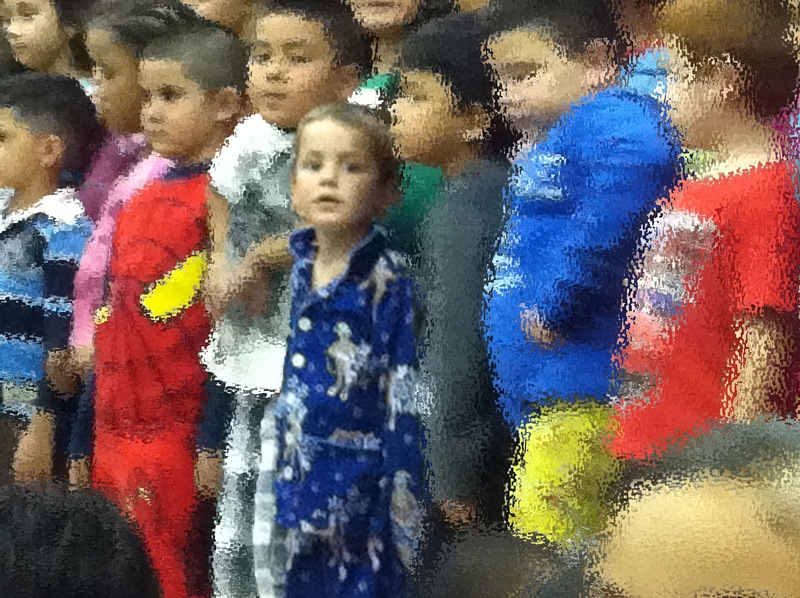 Thursday was the first one, entitled: "Read to Dream Literacy Night." 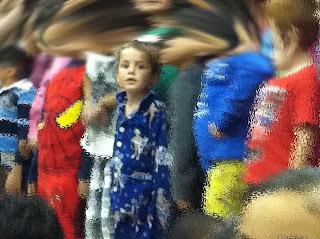 The kids and teachers all wore their pajamas along with bathrobes and slippers. The kids sang some songs and recited a story and the principal read everyone a bedtime story. Then students were invited back to their own classrooms to do some "make it/take it" projects. First we went down to Henry's classroom where the kids got to color two snakes with the alphabet written on them. One snake is the game board and the other you cut out to create a letter or sound matching game. The kids shared the coloring responsibilities. Then we went to Frances' classroom where they kids each got to make a bookmark and decorate it with yarn and stickers. Benjamin went to town with the stickers! The kids also got a free book as they were leaving. We were among the last to leave (SHOCKING!!) and I vaguely remember rolling my eyes as I heard one of the teachers telling Henry, "Yes. You can have two books." In the car he showed me both of his books. "Look, Mommy! I got the attic book and a Robin Hood book!" As we were driving home, I told the kids we would finish up one story and go to bed (BONUS: They were already in their pajamas!) Of course, Henry had to push things, "Can we read my attic book too, Mommy?" I said, "OK, fine. We'll finish the monster book and read your attic book." And he says, "What about Benjamin's book?" But I don't remember Benjamin getting a book, so I'm not sure how I can read it. Henry says, "He has the Robin Hood book!" The jury is still out on whether Henry tricked everyone into giving him two books by saying one was for Benjamin, or whether he really did get the book for Benjamin. I'll leave it up to you to decide.